"The magazine is every bit a part of the rifle, as much as a barrel or bolt, but it's also one of the most vexing components to correct when it goes bad. ThisTubb Precision 17-7 stainless steel flatwire magazine spring goes a long way towards perfecting AR15 magazine function." Your magazine IS a spring! After hearing, and experiencing, numerous magazine failures in these rifles, we decided to produce a better spring. Especially troublesome are current production magazines, which frequently exhibit inferior components. The problem is rarely in the "box" and is most often in the spring. 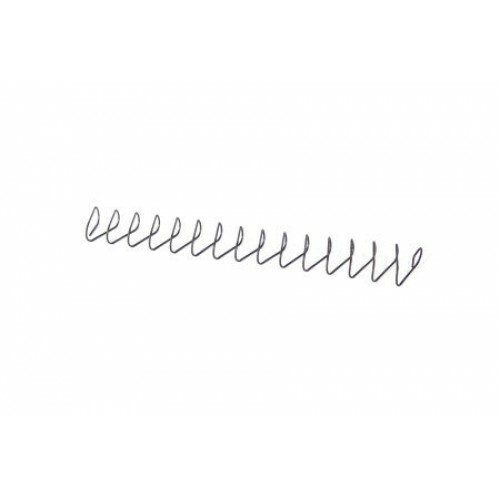 Our stainless steel precipitation hardened spring represents the ultimate upgrade. David Tubb’s AR-15 flatwire magazine spring is a significant performance and reliability enhancement for your AR style firearm. Constructed of superior 17-7 precipitation hardened material, combined with our unique “flatwire” design, our spring overcomes the weaknesses and limitation inherent in conventionally outfitted AR-15 magazines. Standard springs are notorious for failures to feed on both full and partially loaded magazines. The flatwire AR-15 magazine spring provides positive and consistent load against the follower. Where a standard magazine spring loaded with three rounds applies 2.3 pounds of vertical load onto the follower, it doesn’t reliably contain the cartridges. The 17-7 SS spring with three rounds applies 4.7 pounds of vertical load onto the follower ensuring the cartridges cannot rattle out of the magazine. Consistent, constant tension is the key. The Tubb Precision 17-7 SS AR-15 Magazine Spring provides positive pre-load against the follower. As with our other springs, it has enhanced mechanical properties which produce faster rebound. Consistent, constant tension is the key. Plus, there is less drag against the side walls for freer movement. These attributes are of utmost importance to the High Power competitor who is frequently relying on bolt stop engagement on an empty magazine and also positive feeding from "underloaded" magazines. The Tubb Precision 17-7 SS magazine spring is also angled correctly to locate the follower in its optimum orientation. This design modification alone fixes a majority of feeding problems. Another advantage of this spring is faster, more positive bolt stop engagement, saving wear on the part and also ensuring its correct function. As with other Tubb Precision 17-7 SS springs, the superior stainless steel material will last well beyond the lifetime of any magazine. Available individually or in packs of three and five these springs fit any "30-round" size AR-15 magazine box.